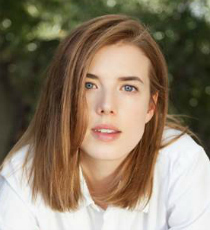 Agyness Deyn’s film credits include Sunset Song directed by Terence Davis, for which she was nominated for Best Newcomer at the BIFAs, Hail Caesar!, Electricity, Pusher, Patient Zero and The White King. On stage, she received excellent reviews for her performance in The Leisure Society at the Trafalgar Studios. She stars opposite Sam Worthington and Tom Wilkinson in The Titan and also appears in Hard Sun.